If you practice yoga and know about its benefits, then you can move on to the next level of yoga and learn about it. You can practice it at home once you learn it. You need to take a little time from your busy schedule to do it. Choose a quiet place to do the yoga, where nothing can disturb you. You also need a yoga mat. Karma yoga, Dhyana yoga, Vinyasa yoga, Bhakti yoga, Ashtanga yoga etc are some of the well known yoga. Other than these there are some other types, which are not well known. Super brain yoga, prenatal yoga etc are some such yoga. These are different from other types. Super brain yoga is excellent for the proper functioning of the brain. Brain is one of the most important parts of your body. If the brain remains healthy, all other functions of your body will also take place properly. A fully developed human brain consists of 300 million neurons connecting the left and right sides of the brain. These are so minute that 30,000 of them can be fitted on a pinhead. Brain also needs proper exercise as do the other muscles of the body. Super brain exercise is a simple squat exercise and offers lots of benefits to young students as well as adults. It is an ideal exercise for those suffering from attention deficit disorder (ADD), Attention deficit Hyperactivity disorder (ADHD), Down Syndrome, Alzheimer’s and so on. By doing super brain yoga, your brain will function fast and it will improve the performance of the brain. This yoga is referred as ‘the new way of yoga that improves the brain’. Super brain yoga includes some exercises or poses. You will get best benefits of Super brain yoga by practicing it early in the morning. Stand straight on the floor in Tadasana pose. If you can, stand with your face towards east, facing the rising sun. If you do not know the direction, you may face any direction you please. Now raise your left arm in front of you and fold it at the elbow. Take a deep breath and hold your right ear lobe with the first two fingers (thumb and the index finger) of your left hand. Make sure that your thumb is facing on the outside, opposite to your face. Next you have to extend your right arm in front of you and fold it at the elbow. Hold your left earlobe with the thumb and index fingers of your right hand. Here also your thumb must be facing opposite to your face. When you are holding your earlobe with your fingers, you also have to roll your tongue in the inward direction and try to press it towards the roof of your mouth. Press it firmly. Once you attain this pose, lower your body, so that you bring your body in a squat position. After you attain a squat position, inhale and hold your breath for a few seconds. Remain in this pose as long as it is possible for you. Remember to keep your fingers on your earlobes and your tongue touching the roof of your mouth till you complete doing this exercise. Now you can bring your body back to the tadasana position. Exhale after you get back to this pose. Now take off your fingers from your earlobes and release your tongue. Repeat this 15 or 20 times to get the best results. Super brain yoga may not give you the results that you expect immediately as in the case of other yoga asanas. However, it is very effective in the long run. 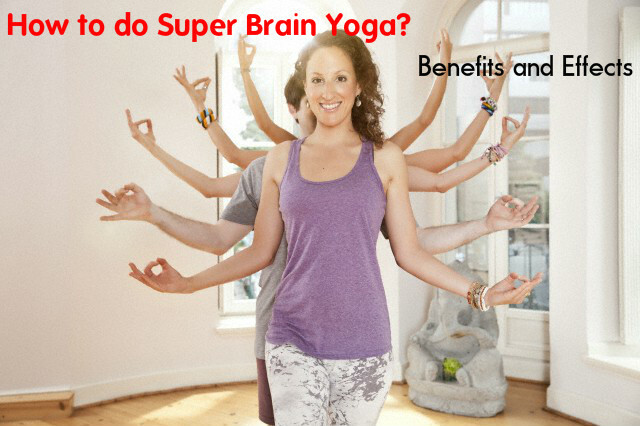 Super brain yoga is very effective for enhancing your brain. If you practice this yoga regularly, you are sure to get its benefits. You will start getting results within three months of practicing it. Super brain yoga is very simple and easy to do. You can practice it without any difficulty at home. Doing this yoga daily helps in making the functioning of the brain smooth and fast. Your thinking capacity will be increased by doing this pose regularly. It is an excellent pose to revitalize your brain. If you have any tension, it will help you get relief form tension. It also calms your brain. This pose is very effective for getting rid of stress. People going through mild depression and anxiety benefit a lot by practicing Super brain yoga regularly. Doing this pose is an excellent way to provide all the necessary ingredients that help in keeping your brain healthy. Your concentration level will be improved by practicing this pose daily. So, students can excel in their studies with this yoga. You balancing skills are also improved by dong this exercise. Children with disabilities like autism, dyslexia etc are advised to do this yoga as it can prove to be very effective for them. Those who have aggressive behavior can get rid of it by doing super brain yoga regularly. It is also a good way to improve the overall health of a person. Super brain exercise is excellent for children with learning disabilities. Children practicing this exercise regularly are known to show increased concentration, memory and scores. Do this exercise more than once a day is not recommended, unless advised by an expert. It is based on transmutation of energy. Females must try not to do this exercise during their menstruation time, as well as two days before and after it. If i breath from my belly so how do i need to do this?